Rangetops have become popular recently. You still have the power of a pro cooking product, but you won't have to bend to move food in and out of an oven. In this article, we will take a look at a few rangetops and talk about some desirable features. Before we do that, let’s describe the difference between a rangetop and a cooktop. A cooktop is a more standard cooking product and less expensive. A rangetop is a professional unit with higher BTU’s like a pro range. Cooktops now have one or two power burners so the difference is not as great. Rangetops can be purchased with a built-in grill, griddle, wok or French top. 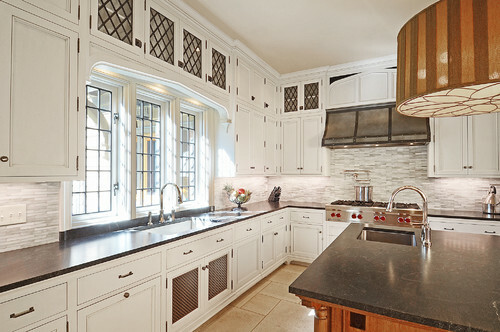 Cooktops are installed into the countertop and a rangetop sits on a cabinet base between the countertop. Typically, you will have 6 burners on a rangetop versus 5 for a cooktop. Most rangetops are only available in a stainless steel finish. Some brands allow you the option to change the color of the knobs. Wolf, for example, offers red, stainless steel, or black knobs. Thermador features stainless steel knobs but you can buy blue ones. BlueStar has the option to customize the trim and knobs with over 750+ colors. Rangetops are offered with different top configurations. Depending on the size of the rangetop, you can purchase it with all burners, burners and a grill or griddle, as well as a mixture of burners, grill, and a griddle all in one. Now, if you have a grill on your rangetop, you need to have a powerful enough ventilation fan to handle all the smoke, grease, and temperature that emits from the rangetop. Rangetop sizes are typically 24”, 30”, 36”, 48” and a few in 60”. The wider you go the more options you have as far as adding a grill, griddle, or both. Important note: Always specify Natural Gas or Liquid Propane when ordering any gas rangetop. The burners and configuration on a rangetop are the same as you would find on a professional range. If you like cooking with high heat, look at the chart below for the most powerful units. The other important question would be to ask what product has the lowest simmer as well as the number of burners which can allow for low simmering. A quick note: I would not recommend using downdraft ventilation with rangetops. The burner output is too powerful for this type of venting. After all, heat and smoke rises, so you would have a better capture area with a vent hood above the cooking surface. Below is a chart comparing the burner output of a 30-inch and 36-inch all burner gas rangetops. These are some of the most popular rangetops on the market. As you can see from the chart above, Wolf and Thermador will have the lowest simmer burners. Thermador has 2 extra low simmer burners on the left side of the rangetop and each burner can simmer down to 375 BTU. Thermador’s simmer burner’s cycles on and off to keep consistent temperature when simmering. Wolf can simmer constantly on all burners with the lowest small simmering burner being a 300 BTU burner on the back left corner. Miele and Wolf have an infrared grill. It has a similar sear as an outdoor grill and is much easier to clean than Viking's regular gas grill. Thermador has an electric grill with briquettes at the bottom. It is consistent, but not as hot. Thermador was established in 1932 and is the 3rd largest appliance manufacturer in the world. Thermador is a fully owned subsidiary division of BSH Bosch home appliances. It was purchased by Bosch in the late 1990’s. Thermador rangetops will give you two extra low simmer burners on the left side of the that can simmer down to 375 BTU. All of Thermador’s burners are 18,000 BTU’s. These burners are pedestal burners meaning it is raised up from the surface to allow for easier cleaning underneath. Thermador’s star shaped burners will also allow for slightly more flame spread as well. 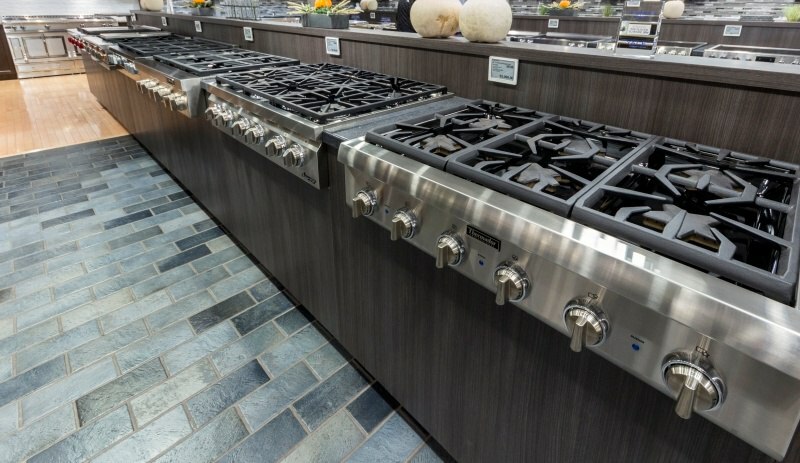 Thermador offers their rangetops in 30-inch with 5 burners, 36-inch with 6 burners or 4 burners with grill or griddle, and 48-inch with 8 burners or 6 burners with a grill or griddle. Wolf has been a name in the professional cooking equipment in restaurants and hotels for more than 70 years. In March of 2000, the Wolf appliance company became part of Sub-Zero and was modified for the serious in-home cook. Sub-Zero took over the Wolf line and reinvested in their products with completely new designs with better simmer and double convection technology in the ovens. The Wolf rangetops offer dual stacked, sealed surface burners, all with simmer capabilities and automatic reigniting. The smallest burner on a wolf rangetop can simmer down to 300 BTUs. Wolf’s rangetops have the best grill out of these other brands. Both the grill and griddle uses a ceramic infrared technology which is more powerful and easy to clean. Wolf offers a 30-inch rangetop with 4 burners, 36” with 6 burners or 4 burners with a grill or griddle. The 48-inch Wolf rangetop is offered with a grill, a griddle and 4 burners or 6 burners with a grill or griddle. Jenn-Air was originally founded by Louis J. Jenn in Indianapolis, Indiana in 1947. Jenn-Air was one of the first manufacturers to come up with a self-ventilated downdraft range. Whirlpool, the new owner, invested 300 million dollar into Jenn-Air in 2007. Jenn-Air’s rangetops are offered in a 30” with 4 burners, 36” with 6 burners or 4 burners with a griddle, as well 48” with 6 burners and a griddle. Jenn-Air offer’s a 20K BTU stacked power burner as well as some 15K BTU burners. Jenn-Air small burner can simmer down to 500 BTU. Their chrome-finished electric griddle provides even heat distribution for even cooking and is the easiest to clean. Miele is the largest family owned appliance business and it is based in Germany. Miele is well known for their reliability with products such as their dishwashers and their manufacturing quality. Professional rangetop is a new category for Miele since 2014. Miele rangetops come with dual stacked burners with true simmer and stainless steel backlit knobs. Miele’s power burner is 19,000 BTU. Miele rangetops come in 30”, 36” and 48”. The 36” and 48” can be purchased with an infrared grill or griddle. The grates are dishwasher safe for cleaning. BlueStar rangetops are offered in many different top configurations. It is available in a 24”, 30”, 36”, 48”, and 60” widths. The 48” BlueStar rangetop is offered in a 4 burner configuration with a charbroil grill and griddle, 6 burners with griddle, as well as all 8 burners. You can also have a 24” griddle or charbroil on 48” rangetop with 4 burners. The power burner on a BlueStar range can be as powerful as 22,000 BTUs of intense, concentrated flame for ultimate high heat cooking. The platinum version offers a 25,000 BTU power burner. BlueStar offers over 750+ custom colors for customization. The removable stainless steel drip tray under the gas burners makes it easier for cleaning. Manufacturers will sometimes offer incentives for purchasing a package from the same brand. These incentives are time sensitive so don’t wait until the last minute to take advantage because these promotions can go away at anytime due to unexpected higher volume sales. Thermador’s famous 1, 2, Free promotion is very popular. Purchase a rangetop and a wall oven; receive an instant $1,300 rebate towards a Thermador dishwasher. Jenn-Air is also offering a similar promotion. Purchase a rangetop and a wall oven, receive an instant rebate of $1,300 to put towards a 3rd qualifying Jenn-Air product. Sub-Zero/Wolf is offering a $1,000 mail-in rebate when you purchase a wall oven, rangetop, and add a built-in Sub-Zero refrigerator. As you add more of their products to the same invoice, you qualify for Wolf Gourmet accessories like blenders, convection toasters, pans, and knives. Each unit has its attributes. Thermador may have the best burner with good power and the best simmer. If you like to grill and griddle, then Wolf and Miele have an infrared grill. For an easy-cleaning griddle, Jenn-Air's chrome-infused griddle is a good consideration. Get our free Pro Cooking Buying Guide for tips, trends and more about pro cooking options. Over 180,000 people have already found answers in a Yale guide.